NSH Mortgage provides the highest quality of customer service to give you the best rate on your next home loan, purchase loan, or any other mortgage. 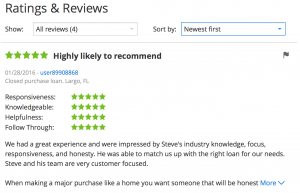 Read our mortgage reviews of what our past and current clients have said about NSH Mortgage on Zillow Broker Mortgage Reviews, Yelp, and below. Would you mind providing a client testimonial about your overall experience? You guys were awesome to work with, any time I had a question you had an inmidiaye answer! Thanks for helping me out so much! Was there anything we could have done to improve the overall experience for you? My experience with you guys has been so smooth so far I don’t have anything to correct you on. Not really anything to improve in atleast on the side I see! You guys have been great! Would you mind providing a client testimonial about your overall experience? I had a great experience with the this company.Steve Hays was fantastic and very friendly.I would recommend him to everyone. Was there anything we could have done to improve the overall experience for you? No , everything was great. “December 2013 – Here is one of my mortgage reviews with NSH Mortgage. I am a business owner that needed to buy two beach homes fast as an investment. I applied with my local bank manager and was told “Nik do not worry, you will close within 14 days” – Not true at all. Weeks passed by and they kept asking for more and more docs. I found Steve and he said “Nik do not worry, you will close within 14 days” – The difference was that Steve made it happen. Big banks just submit various items and pray they get an answer. When a problem happens as they always do, they have no idea of what to do and the deal is lost because of the pointing fingers game. Steve answered EVERY call, got me a better rate than the big banks and made sure I did not lose my deal. When the normal fires arose, he put them out and got us to closing. In summary, a very honest guy and a pleasure to work with. He actually under promises and then delivers more in the end which was a pleasant surprise. He’s my go to money guy from now on. Yes getting a deal on the loan is important but finishing the deal is even more important as a business owner. NSH Mortgage /Steve will do both for you. In this market, you can’t afford to lose that “dream home” that took forever to find and negotiate a deal on. “The only time i’m not worried about signing mortgage papers, are when they are being processed by Steve. Steve is an honest person with a heart for helping people. Steve and his team from NSH Mortgage will take whatever time is needed to answer any questions and explain the process. The process went very smooth and Steve and NSH Mortgage were very responsive. Their attention to details is a piece of mind. It only required two office visits – one to initiate the process, and the second is to sign the papers. Contact Us to learn more at NSH Mortgage to guarantee your best interest rate!